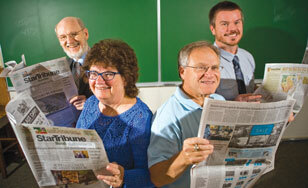 George Killough, Patricia Hagen, Tom Zelman and Ryan Vine are all book reviewers for the Upper Midwest’s leading newspaper. Laurie Hertzel, a longtime journalist who's now the senior books editor of the Star Tribune newspaper of Minneapolis, was on the St. Scholastica campus a lot in the early 1990s, working on a book called "They Took My Father." She and author Mayme Sevander created more than just a good story. Hertzel made connections with a number of English professors who, years later, would review books for her pages. First were Tom Zelman and Patricia Hagen, who began in 2008. Zelman has completed about 30 reviews on modern fiction and books about China; Hagen has been completing about 10 per year on fiction and nonfiction, often on Irish or art-related topics. "We're English professors," Zelman said. "We love books. We love free books. We love to share our thoughts about books. So reviewing has been a lot of fun." In 2009 Hertzel asked them to begin reviewing poetry. They enlisted their poet colleague, Ryan Vine. Since then, he's completed six reviews about poetry and books of essays on poetry. In 2010, George Killough joined the mix and has since completed two reviews, both on documentary literature. His most recent review of the teenage diary of F. Scott Fitzgerald was published on Oct. 6. There's a reason for so much St. Scholastica representation in one of the country's bigger newspapers, Vine said: "We have some great scholars in our department. They're knowledgeable and interesting people, which makes their reviews fun to read."